Superb location at the top of steep slipway with spectacular sea views from the first floor sitting area, which has a panoramic window with window seats looking straight out across the cove to the horizon. 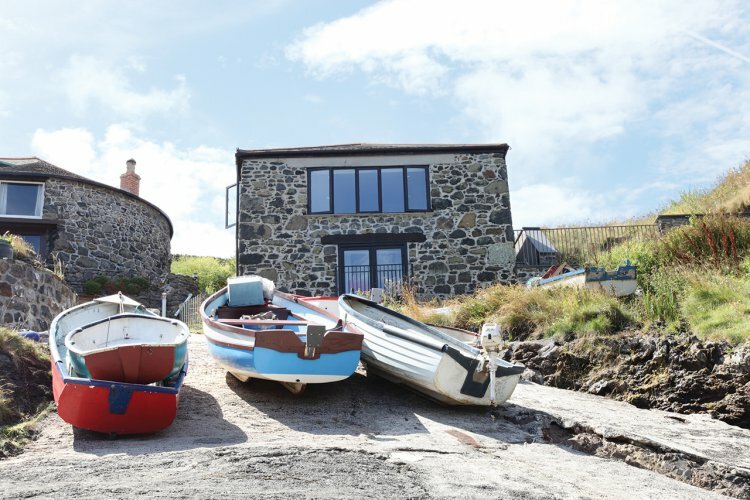 Originally the winch house to the first Lizard Lifeboat Station (The Boat House), the interior has been imaginatively restored keeping where possible the original materials to make an exciting home in a superb setting. The bedrooms are both on the ground floor and have stone walls and ceramic stone floors with rugs. The master bedroom with sea views has a 5' king-size bed. The second bedroom has twin beds. The bathroom also on the ground floor has a vanity unit, bath with shower over, toilet and the washer/dryer. Polished wood staircase (stair gates provided) leads to the open-plan living area with exposed stone walls and pine panelled ceiling. The sitting area is comfortably furnished with settee and easy chairs, colour TV with Freeview, DVD, video and CD player, Wireless internet and the dining area has pine table and chairs. Fully fitted kitchen with built-in electric cooker and hob, microwave, fridge, freezer, automatic washer/dryer and dishwasher. Door to splendid decking with table and chairs, steps to tiny wild garden with small shallow pond.